Part of my everyday gear includes a Wacom. At home and my previous jobs, that would have been my personal Intuos 4. 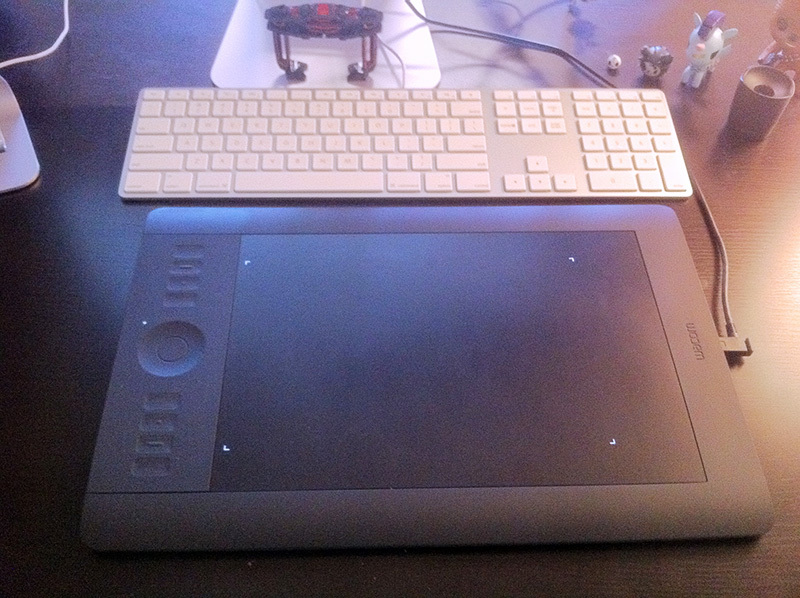 At Code 42, I received a brand new Intuos 5 which includes touch gestures, similar to a trackpad. Unfortunately, those gestures just don’t work reliably. And because of the way I use my tablet, with the keyboard above, I got a lot of accidental touch events. Here’s how I tamed them. I slowed down the pointer speed to reduce unwanted cursor movement as I use the keyboard. I also completely disabled any clicking. Zoom & rotate were finicky at best, and don’t even seem to function in After Effects, so they were disabled as well. This leaves scrolling and navigation, which is what I really want touch gestures to be. It’s really nice to just lift my pen and use the same hand to switch between desktops, reveal the desktop, and even use Launchpad. ((Yes, sometimes I use launchpad. If set up right, it can work well.)) For custom gestures, I modified three finger tap & hold to save, and disabled five finger anything. Holding a pen, it’s not an easy gesture, especially when trying to keep the pen far enough away from the tablet to enable touch. Ideally, I’d like to see Wacom do three things with their drivers. 1.) Somehow increase reliability of touch, but I have no idea of the engineering already involved in the current drivers. 2.) Be able to relegate touch input to a certain portion of the tablet, in my case the left side or corner. 3.) Add a customizable delay to the “Show Express View” option. This wasn’t covered here, but if you rest your finger or hand on the Express Keys, a HUD pops on screen showing you what they do. Current delay is just under a second, and I hit it a lot while typing.